Did you know that 380 million tons of plastic were produced in 2018? That brings the total quantity of plastic up to about 6.5 billion tons since its introduction in the mid 1950s. Yeah, that’s a lot of dixie cups. Generous estimates say that first world countries manage to recycle about 25 percent of their plastic waste. If it’s disposed of responsibly, the remaining waste should end up in the landfill. But I would encourage you to visit your local landfill and see for yourself just how responsible it is. Like the holocaust museums in Germany, they are something every citizen of this planet should be aware of. Civil society has found a way to make it look like our garbage simply disappears at the end of every week. But that’s not actually how it works. Talk about burying the truth. Meanwhile, we know for certain that astronomical quantities of plastic and packaging are ending up elsewhere. How do we know that? Because there are multiple islands of litter floating around the sea, and they are larger than some countries. And I don’t mean Malta or Liechtenstein. The Great Pacific Garbage Patch, though difficult to measure, is at least the size of Texas or France, and some estimates say many times larger. But the plastics don’t just sit there, floating about harmlessly like a few olives in a salty martini. If only. For several decades now, birds and marine life—not trained to be on the watch for harmful particulates—have been consuming this toxic debris at a brisk and predatory pace. Biologists estimate that 90 percent of birds now contain particles of plastic. And by 2050 there will likely be more plastic in the seas than fish. Let me say that again: More plastic than fish. You would have to be numb and heartless not to recognize this as the global crisis that it is. And I would have to be somewhat naive and Polyannaish if I told you not to panic. By all means, if there were ever a time to panic, this is it. We should be panicking in the streets. We should be panicking at the mall. We should be panicking in classrooms. We should be panicking in the halls of Congress. Perhaps you feel helpless. Perhaps you don’t think there’s anything you can do as a single individual that could make a difference. But we need to do more than just panic. And we can. These ginormous garbage patches are nothing more than a conglomeration of single individual pieces, and we as individuals need to start doing something. Now. A lot of people are talking about zero waste these days, and that’s a good thing. But don’t be put off by the fact that you will never actually be able to reduce your waste down to nothing. The point is, there are dozens of simple things you can do to drastically reduce your waste. Two of the biggest sources of waste are packaging and single-use plastics like cups, straws and utensils. And these are some very easy things to scale back on with just a minimal adjustment of your personal habits. We’ve known for years about bringing our own shopping bags to the grocery store. This is basically square one. It might take a few trips to get into the habit, but your best bet is simply to keep some extra bags in your car at all times. Nowadays, you can find flimsy tote bags just about anywhere. But if your goal is to reduce your waste, then you’ll want heavy duty canvas (non-plastic!) bags that are going to last. Check out this set of three cotton canvas grocery bags from Amazon. Or this set of organic canvas and jute tote bags. Shopping bags are the first step. Now what about produce bags? If you’re still putting your bananas into a disposable plastic bag at the grocery store, I need to tell you something: STOP! Please. Bananas already come individually wrapped. Nature’s packaging is perfect. Don’t mess with it. But you might still want to bag your grapes, your lettuce and your broccoli. You could easily go through 5 or 10 of those bags every week, and they disintegrate quickly so they’re almost impossible to reuse. But you can find lightweight reusable bags for that too. A set of 9 cotton mesh produce bags can eliminate the need for hundreds of disposable bags each year, in your household alone! When you’re really ready to step up your game, you can start bringing your own jars and containers for the bulk dry goods section, for pasta, grains, cereals and so on. When you think about it, almost every single thing you eat comes in a package, but it doesn’t have to, and it sure doesn’t have to be a single-use package. More and more grocery stores are expanding their bulk sections and zero waste stores are increasingly offering a wide range of bulk goods and cleaning products. Just bring a container and refill it with granola, honey, shampoo, tooth paste, you name it. I’m partial to glass jars, and a set of 6 32-oz. jars will definitely get you started on converting your pantry into something closer to zero waste. For smaller servings I usually just save and re-use old jelly jars. When it comes to disposable living, one of my biggest pet peeves has to be the single-use plastic utensil industrial complex. Throwaway forks, throwaway containers, and my greatest nemesis, throwaway straws. Make a habit of keeping a set of bamboo utensils in your car, in your purse, in your desk, or all of the above. Our family has been using re-usable To-Go Ware utensil sets for years and we love them. They are durable, easy to clean, and come in a nice carrying case that includes fork, spoon, knife and a pair of chopsticks. They also make sets for the kids, ideal for the lunch box. But for true minimalism, you have to love the bamboo spork. The pinnacle of efficiency, with its sleek design and low profile, nothing can rival the functionality of the bamboo spork. You can even find them at Bambu Batu with a handsome cork carrying case. And yes, they make perfect gifts. More sporks means less waste, so give generously! Finally, stop throwing away those pesky plastic straws after one use. Instead, you can order a set of 8 stainless steel straws that basically last forever. The set even comes with nice little brush keep the straws clean. You might ask, with 8 billion people, what difference can I make with my one little straw and my one little spork? But if 8 billion people all ask the same question, and come back with the right answer, then of course we can make a difference. So go ahead, get started today, and be a part of the solution. Learn more: For more tips on earth conscious consumption, check out the following links. Disclosure: Bambu Batu is a participant in the Amazon Services LLC Associates Program, an affiliate advertising program that helps pay for the maintenance of the site. When items are purchased through our links, Bambu Batu receives a small commission at no additional cost to the customer. It’s a free and easy way for you to support a small, family-owned business like ours. Can I build a house from bamboo? Imagine a house built entirely from bamboo. Natural yet modern, simple yet elegant, rustic yet secure. Maybe I’ve just watched too many episodes of Gilligan’s Island, but I can already hear the palm fronds rustling in the breeze, the bamboo canes clonking softly, and the bonobo chimps making monkey love in the distance. Almost as arousing as the size of my minuscule carbon footprint. But is it just one great tree-hugging fantasy, or can you really build a house entirely out of bamboo? Well, it probably depends on your definition of a house, and what you mean by entirely. If you want to sleep in a grass-roof shack like Gilligan and the Skipper, then, yes. You can do that entirely with bamboo poles. Although you might still want some palm or sedge thatching for a bit more insulation. But if you’re looking for a modern family home with all the amenities, then you’ll have to talk to the Professor. When it comes to bamboo construction, there are a few names that stand out, genuine experts in the field. So let’s head to Colombia. Engineer and architect Simón Vélez has been designing incredible bamboo structures and pavilions around the world for decades. A number of his buildings and installations have received prizes, and his name is almost synonymous with bamboo housing. In fact, his book, Grow Your Own House, is one of my favorites on the subject. Less renowned, but certainly prolific, Estaban Morales is a civil engineer, also from Colombia, with a very impressive resume of bamboo construction projects. Specializing in bamboo, earth and wood building, he has participated in the design and construction of hotels, houses, restaurants, temples and other buildings throughout Colombia and Latin America. Estaban’s website showcases a beautiful collection of building that he’s worked on, including the Izakaya Restaurant in Mexico, pictured above. Now let’s head to the Philippines, where 23-year-old engineering student Earl Forlales is making history with his cutting edge housing solution. Inspired by the bamboo huts that cover his native islands, Forlales developed the Cubo, a simple, modular bamboo house that can be manufactured in a week and assembled in about four hours for a meagre $10 per sq.ft. Judges from the Royal Institute of Chartered Surveyors awarded Forlales first prize in the Cities for the Future competition in November 2018. His incredible design aims to address the critical housing shortage facing the Philippines. Forlales now has his eyes on some land on the outskirts of Manilla, and we’re all eager to see the Cubos go into full-scale production. Bamboo houses are nothing new in tropics of southeast Asia, nor in the shadows of the Himalayas. Habitat for Humanity, an international non-profit organization dedicated to building houses for families in need, recently launched a program to build a series of bamboo homes in Nepal. Framed partially with concrete columns, these simple, affordable homes rely almost entirely on locally harvested bamboo for their structural integrity. Volunteers, coming primarily from western countries, assembled the homes alongside a team of more experienced local builders. Together they cleaned, split and weaved the bamboo to construct the rustic but solid walls. Later they mixed a kind of plaster from mud, straw, water and dung, which they used to coat the floors and walls, inside and out. Corrugated metal sheets served as the roof, and the end result was some wonderfully inviting housing, completed in less than two weeks. Check out YR Architecture Design to see the complete story with dozens of photos. Now let’s say you don’t have the ingenuity of the Professor or the wherewithal of Thurston Howell III, and you lack the means to design and construct one of these masterpieces of green-building for yourself. Or you live in a country with much stricter building codes. No problem. After all, you’re probably not looking to build a house of god, although some of Simón Vélez’s bamboo temples are pretty spectacular. You just want a modest family home with a little bit a of style and the least environmental impact possible. It’s all possible, and you don’t even have to relocate to a developing country in southeast Asia. Introducing Bamboo Living Homes, based in Hawaii. For 25 years now, partners Jeffree Trudeau and David Sands have been paving the way for bamboo home enthusiasts around the world. Not only are these innovative homes easy on the eyes and soft on the earth, they’re also light on the pocketbook. What’s more, Bamboo Living is the first company in the world to design bamboo houses that meet international building standards. Their prefab bamboo structure come as small as 100 square feet, making an ideal tea room or meditation space, starting at a paltry $8,300. You can assemble these small models yourself in as little as two days. But from there, the options go through the roof. Bamboo Living offers some 3 and 4 bedroom models with over 2,700 sq. ft. feet, plus porch space of up to 1,100 sq. ft. Check their website and feast your eyes on all the magnificent models and designs. To date, the company has provided more than 350 bamboo homes on the islands of Hawaii and elsewhere around the world. The style of construction is ideal for tropical habitats, aesthetically and in terms of climate. Every model has the option of single-wall construction for temperate climates or double-wall with space for insulation in hot and cold zones. If you’re looking for the most eco-friendly and sustainable bamboo house possible, that’s also reasonably priced and permitted by building regulations, look no further. For those of us who live and breathe all things green, Bamboo Living Homes are like a dream come true. Once the home is built, you can fill it with bamboo furniture and stock the rooms with sumptuous bamboo towels and bamboo bedding. Then, of course, you’ll have to invite your friends over for piña coladas and a three-hour tour. FULL DISCLOSURE: This article may contain affiliate links to Amazon and other websites, so that if you purchase any items through those links we may receive a small commission. This helps to finance the website, but we do not allow it to bias our opinions and recommendations. And we do NOT receive commissions from Bamboo Living Homes; our enthusiasm is perfectly genuine. It’s Memorial Day Weekend, and San Luis Obispo’s natural fiber fashionistas know what that means. 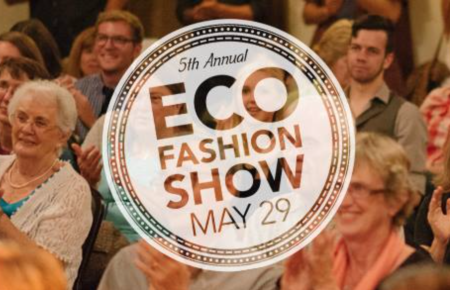 The 5th annual Eco Fashion Show is just days away, taking place at the Odd Fellows Hall at 520 Dana St., on Friday May 29, at 6:30 pm. A yearly fundraiser to benefit Humankind Fair Trade, a non-profit gift shop on Monterey Street, this year’s Eco Fashion Fashion will feature several local purveyors of fine organic and re-used apparel. Of course, no SLO Eco Fashion Show would be complete without showcasing outfits from Bambu Batu, Hemp Shak and Maule Wear, pillars of our local natural fibers community. Live Local Apparel will also be on the scene with their locally inspired and locally produced t-shirts and caps. Second hand clothiers like Curio, Ruby Rose, Threads and Castaways will also take part, touting the ecological benefits of used clothing. Re-use and reduce! A new addition this year, Eco Bambino will be representing the fashion trends for the little ones. Good-looking models have been recruited from the community to show off five outfits from each participating business. Bambu Batu will feature a number of new styles, including our top-selling Felicity Dress, as well as other perennial favorites for men and women. Be sure to stop by and see what else is new this season in the world in the eco fashion. Tickets are $15 in advance, or $20 at the door, and proceeds benefit Humankind Fair Trade, a non-profit shop that provides income to artisans and farmers in the developing world. Also check out the vendor fair before the show, and don’t miss the silent auction, with some exceptionally nice gifts from each of the participating businesses. Yesterday, hundreds—perhaps thousands, but surely a dismally small number—of U.S. citizens went out to the polls to participate in this American experiment we call representative democracy. Today we can breathe a collective sigh of relief that another season of mudslinging is behind us. But more importantly, I’d like to extend a heartfelt congratulations to one of the few real winners in this election cycle. Her name is Heidi Harmon, and she ran what was probably the cleanest, most honest and respectable campaign I’ve ever seen. For the first time in my life I had the privilege of casting a vote for a someone I genuinely believed in, someone I honestly believed to be a real person with a heart and soul, an artist, a mother, and a citizen of the planet, willing put the collective interests of her planet ahead of the political and economic interests that have always set the rules and defined the playing field. At the end of the day, Heidi’s opponent, the incumbent Katcho “I-sell-gasoline-for-a-living-so-don’t-ever-expect-me-to-take-a-stand-against-big-oil” Achadjian (R) had more votes, and will thereby keep his Assembly seat for the 35th district. But anyone who’s ever spoken with Heidi, or attended any of her rallies, or met any of her team of grassroots supporters, or read any of their numerous letters to the editors that have been published in the local papers over the recent months, must know that regardless of vote tallies, Heidi Harmon will always represent the winning side. Taking the gas station entrepreneur head on, Heidi ran as a self-identified “climate change candidate” and set herself apart from nearly every politician from either major party. In neighboring Santa Barbara County, Big Oil demonstrated its might by soundly defeating Measure P, which would have banned fracking and certain other form of oil exploration, outspending the ban supporters to the tune of $7.6 million to $284,000. On a brighter note, Northern California voters passed Measure S in Mendocino County, effectively banning fracking in that county and giving the citizens—not corporations—the final say in their local water use policies. Let’s just hope Mendocino, and not Santa Barbara, will serve as the bellwether for future fracking controversies around California and the nation. And let’s also hope for a future in which we are less often forced to settle for the lesser of evils, and more often given choices we can be proud of. Local participants can also attend innovative workshops on community building, environmental stewardship and ethical investing. You’re also encouraged to join field trips to local points of interest, to study bird watching at Hi Mountain Condor Look Out, community planning at Tierra Nueva Cohousing in Oceano, and the future of farming at Kukkula Winery in Paso Robles. For pricing details and a complete schedule of local and national events, check the Bioneers website. Tickets available online and in-person at Bambu Batu.